It’s official, I’ve gone loco! I haven’t been so obsessed with something, since the time I saw Mel Gibson on the telly! I have a huge addiction to everything that sparkles! *_* It doesn’t even matter if I’m not going to wear it, EVER! I just need to have it! Of course, sparkly clothes are a bit more expensive, so thrift shopping, here I come! This here, glittery eye-candy, is my new second hand purchase I snatched, while still sick and disoriented. I love the slight aqua coloring and it’s an awesome accessory to any pair of dull pants. Sorry for the photo heavy post, this is the first time I like a piece of clothing more than beer! And even better, this whole look is thrifted, except for the Nowistyle scarf. Shoes, blouse, jeans and bag are all second hand, damn I’m good! Do you guys like sparkles? 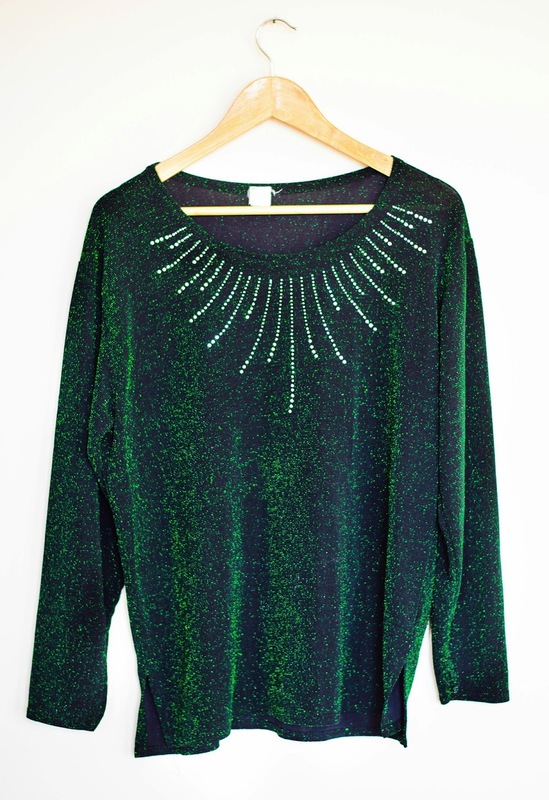 I go through phases like that, with sparkles – and I think I feel another one coming on, seeing this jumper. It is incredible! I don't know if I could pull it off, but you certainly do. Loco but looking great. I like the top on you because it brings out your eyes. Also, I like how you tucked it in. Girl, you look GORGEOUS! I love sparkles too. I'm a total magpie. Those blue/green shimmery colors always remind me of this nailpolish my mom and I used to do our nails in when I was like, 7, and that reflective nailpolish came out as the ~new nail thing~. 😀 Sparkles and glitter are FUN and anyone who says otherwise is a turd! Naw, that's mean, but sparkles are pretty grand. I love that shiiirt! YOU LOOK BEAUTIFUL. Everything about this, from the amazing top to the way your jeans fit you perfectly. In love with this look! Amazing outfit as always and great SH find! You matched it very well! Just please doll don't lose any more weight xD You look very very skinny on these photos… It's not a negative comments, so please don't take it that way, that's just my opinion 🙂 Lova ya! i looove this outfit. your denim pants are amazing! And it's definitely official, that you NEED to be addicted to glittery stuff because it fits you perfectly. I love the green color and it's just great with your eyes. I do love sparkle, especially when it's super kitsch and unexpected. This outfit is just perfect. Glitzy, yet casual, and soooo cool. I just love it! I can't believe that whole look is thrifted, you have a gift for thrift! I love your shoes and jeans!